Forty one years ago today, September 23, democracy stopped in the country – Marcos declared martial law – he threw the dissenters against his regime in jail, padlocked the press and congress and ruled the country by decrees. Today however, people, except for those who were still nostalgic about the ‘joys’ martial law brought upon the country, saw martial law declaration a cover up for a ‘power grab’ from those who should legitimately exercise it, the people — in order to monopolize state power and economic opportunities and to centralize banditry in the hands of Marcos, his families, friends and cronies. Whatever is happening in the country today, I would hasten to add, the Marcos plunder was unparalleled in the history of the country. Marcos had perfected the art of ‘pillaging the treasury and the wealth of the nation’ that whomsoever comes after his downfall would pale in comparison in the magnitude of his plunder. You only have to read the right source of the corrupting horror of martial law instead of putting blinders to deny that such corruption and brutality exist. Marcos ruled the country for more than 20 years and 14 years of which were under martial law. Opposition stalwarts and the press had been silenced for a while and the judiciary was under his pockets. The entire country was primed up for wholesale looting. Cory and Ramos ruled for 6 years each, Erap for about 2 years and Gloria Macapagal Arroyo for 9 years. Under their rule, oppositions were upbeat and the country has a licentious press. Looting was not as grand and unmitigated as during the time of Marcos. People who did not resist Marcos in the early martial law years had hoped that they can live in a society without their liberty in order to have bread. But they lose in their Faustian bargain. To aspire for bread under the veneer of security assured by martial law was an illusion. Soon they found that their liberty was gone and there was no bread forthcoming either! There was reason for the delay (proclamation of ML). Marcos needed one man, the first name on his list of ‘target personalities’ – Ninoy Aquino. The senator’s defiant conduct a year earlier after the president’s suspension of the writ of habeas corpus had been most instructive. The image of Aquino marching from hospital to hospital after the Plaza Miranda bombing had, as the Free Press observed, “crystallized the people’s timid resentment against the Marcos administration into an unshakeable determination to resist.”. The people fixed their eyes on Ninoy. On the night of September 22, 1972, Marcos could not afford to let Aquino ignite resistance by word, deed, or image. So he waited. At the Hilton, Colonel Romeo Gatan knocked at the door of room 1701. Inside, Aquino was conducting his last meeting as a Philippine senator, a congressional conference committee session on tariffs and taxes. His arrest was polite and swift. His friend, Sonny Osmena, the young senator from Cebu, stood in the middle of the room in disbelief as Aquino appeared out the door, Marcos had what he needed. The military plan was activated. It was just after midnight. Democracy was transformed into dictatorship. Back at the Free Press, Teddy Boy was on the phone when the Metrocom officers slapped the receiver from his ear. “We have martial law,” said the soldier protecting the paper from left-wing agitators. Everyone out. By order of the President, the Free Press was closed. Teddy Boy rushed out to look for his father. Times publisher Chino Roces heard the news in his telephone-equipped car. It was a call from his wife. A Metrocom raiding party was at the door. Their Quezon City home was surrounded. They had a warrant for his arrest, signed by Enrile. Roces drove immediately to Camp Crame and surrendered to constabulary authorities. It was shortly after midnight that editor Doronila called his Chronicle office to check on the last edition. A clerk answered. Everyone else had been sent home. By whom? Soldiers. The newspaper was closed. Across Manila, raiding parties arrived in the darkness to arrest others on president’s list. They found Senator Diokno at his home. He surrendered without resistance. So did Senator Mitra. But Luis Mauricio, publisher of Graphic, which had carried some of the most lurid coverage of Dovie Beams affair, was dragged from his home. And an anti-Marcos delegate from the constitutional convention, in bed with a serious illness, was forced to the rapidly filling gymnasium of Camp Crame to spend their next several nights on a cot. The telephone ringing next to Ambassador Byroade’s bed awoke him from a sound sleep. It was Richard Usher, the Philippine desk officer at the State Department in Washington, calling to ask about early press reports that martial law had been declared. Tanks and truckloads of troops were sweeping through downtown Manila. Usher informed the ambassador. Byroade snapped on a bedside lamp, suddenly awake. “I thought I talked him out of that,” he said. In the pre-dawn hours leading up to 5:00 A.M., Sonny Osmena waited to be arrested. The young senator, who still limped from his Plaza Miranda bomb wounds, was an outspoken Marcos critic. If his good friend Ninoy and so many others were being arrested, Osmena was sure he too was on the list. He stayed home so he could be found easily. He packed a few personal items. Sitting in a dimly lighted home with his wife, the senator listened for sounds of military trucks. Then, he heard it. There had been false alarms twice before, neighbors coming and going, but this time the commotion was unmistakable. He embraced his wife once more, and then opened their front door. The crew of garbage truck wished him good morning. Osmena was beginning to feel neglected. Manila awoke to an eerie national silence. Chronicle publisher Eugenio ‘Geny’ Lopez, Jr. aboard the family yacht, Miss Iloilo off the shore of Batangas south of Manila, could not raise a signal on his portable radio. He wanted to hear the morning news normally broadcast over the family-owned radio station. But that part of the radio dial was dead. He turned the dial. More silence. Finally, he found one station broadcasting popular music, the voice of Filipina singing favorite Nora Aunor. But no news. No commercials. Geny suspected a radio malfunction and asked the ship’s captain to tinker with it. Why did it receive only one station? The answer arrived by helicopter. The military aircraft buzzed the yacht, anchored just offshore, then landed on the beach. Two men in air force uniforms jumped out and called to Geny. They were friends. One asked: “Do you know what happened?” “Martial law.” Lopez thanked them for dropping by to tell me. The young publisher considered sailing for Hong kong. His powerful but ailing father, Ining Lopez, already was in San Francisco clinic for medical treatment, beyond the reach of a Marcos arrest warrant. But Geny, filled with trepidation, ordered a course for Manila. On Saturday, September 23 1972, the president of the Philippines awoke as Dictator Ferdinand Marcos. If things went badly as the day wore on, General Ver was responsible for the president’s emergency escape. It was one of the contingency plans. But there was no sign of resistance. In fact, in his diary that evening Marcos noted that ”things have moved according to plan.” He wrote specifically, and with apparent satisfaction, about the arrests of Aquino, Diokno, Mitra, Chino Roces and Teddy Locsin. During that first night and morning, fifty two out of the two hundred target personalities were taken into custody. Among those missing was “Bomba” Arienda, still hiding in the rice fields of Batangas, listening for hints of public resistance. There was no broadcast news of any kind throughout the day, except for an announcer’s voice periodically interrupting the music to say the president soon would address the nation. Finally, after overcoming the technical difficulties of getting a television station back on the air, Marcos appeared on the nation’s TV screens at 7:15 P.M.
“My countrymen,” he began gravely, “I have proclaimed martial law in accordance with the powers vested in the president by the constitution.. I have had to use this constitutional power in order that we may not completely lose the civil rights and freedoms which we cherish. It seemed to be the realization of Ferdinand’s dream, the fulfillment of his messianic visions. Marcos, the savior of the Philippines, preserving Philippine democracy by preventing its exercise. But to be certain there was no meaningful objection, he took a few precautions: imposing a general curfew, banning free speech and free assembly, authorizing arrests without warrants, outlawing labor strikes, ordering the surrender of firearms, and declaring “rumor mongering” to be a crime comparable to treason. With all criticism abruptly silenced by the mass arrests of political opponents, journalists, liberal priests, and student activities, Marcos created the instant illusion of popularity. Overnight, street demonstrations stopped. Political debate stopped. Newspaper editorials stopped. Democracy stopped. (p. 184-88). 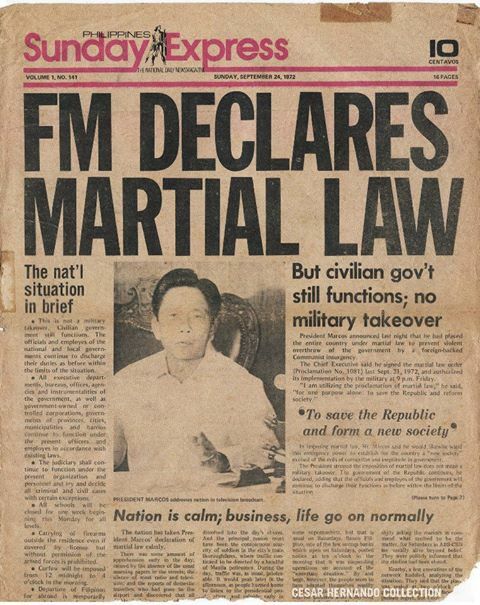 September 22, 2013 in Delusions of A Dictator, Marcos, Martial Law. ← Lorna Kapunan Comes Swinging At AMLC! Hi, JCC. Your article sounds interesting. The Martial Law’s supposed peace and order, prosperity, and discipline has indeed a substantial cost: a cost of our civil liberties. Martial law is indeed horrible in a general truth of every Juan but not for the youth of today. The youth believed in the revisionist version of Martial Law prevalent over social media. They believed and worshiped Marcos as a “God” and a “Messiah” of the nation. They believe that another Marcos (through his son, Bongbong) or a tyrant will fit for the highest office in the land. The sad note here is they will be in triumph (as if their voices matter over us) as we try to build our eroding dike of our resistance of our stances. Let us be vigilant Timow… Let no tyrants and cleptocrats occupy Malacanang again. Enough of Marcos, Erap and GMA already.